The first Lord Selkirk School at this site at the corner of Brazier Street and McIntosh Avenue, was designed in 1908 by local school architect J. B. Mitchell and built at a cost of $72,000 by the firm of Carter-Halls-Aldinger. It commemorated Thomas Douglas, the Fifth Earl of Selkirk. The building’s cornerstone was laid at a ceremony in September 1908, construction of the two-storey structure commenced, and the school opened for classes in February 1909. The school quickly proved too small for the rapidly growing community around it so the 19-room Lord Selkirk School No. 2 was built nearby, between September 1912 and December 1913, by Worswick Brothers Construction. Additions were made to the schools in 1921, 1958, and 1965. In the early 1970s, the two aging buildings were replaced by the present school, constructed in 1973-1974. “Lays cornerstone of new school,” Manitoba Free Press, 7 September 1908, page 12. “Three schools constructed,” Manitoba Free Press, 9 February 1909, page 9. “Accept Worswick tender for Lord Selkirk School,” Manitoba Free Press, 20 June 1912, page 28. “Unveil portrait of Lord Selkirk,” Manitoba Free Press, 19 December 1913, page 3. “Winnipeg schools, No. 20—Lord Selkirk No. 1,” Manitoba Free Press, 7 November 1922, page 17. “Portrait and tablet unveiled at school,” Manitoba Free Press, 11 October 1927, page 6. Death registration [Laura Jane Eisenhuth Brander], British Columbia Vital Statistics. 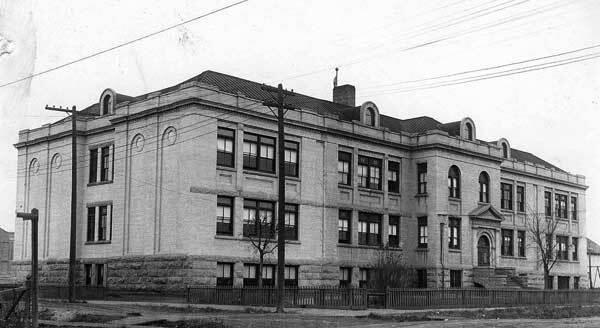 History of Lord Selkirk School, Winnipeg School Division. We thank Nathan Kramer and Borislaw Bilash for providing additional information used here.